Knoxville woman searching for mom's grave, 9 years after death - from WBIR.com in Tennessee. More than nine years ago, Susan Ault lost her mother, Joan Rae Martin, after an extended illness. "It was extremely hard on me because she was my best friend," Ault said. Martin was buried in Bookwalter United Methodist Church Cemetery off Central Avenue Pike. Ault became a frequent visitor to her mother's grave. "I went back and forth for about a year to the cemetery to see her, because I felt like I didn't ever want her to be alone," she said. But then, Ault says the visits became too difficult. She waited about six months before visiting again, but when she returned to the cemetery, she says her mother's gravemarker had disappeared. Read full story and see video here. Thanks, Frank, for the heads up on this! Death of Hollywood Forever Cemetery? 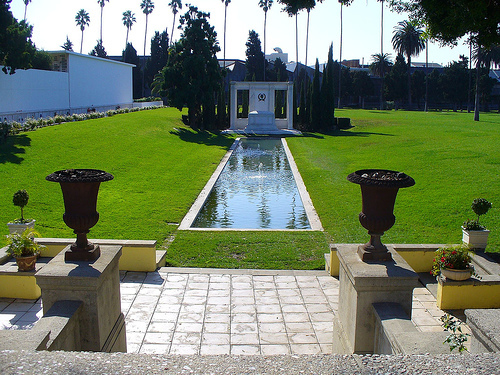 The Douglas Fairbanks (Sr. and Jr.) memorial at Hollywood Forever Cemetery. Anyone remotely interested in Los Angeles cemeteries knows about Hollywood Forever, final resting place to the cream of Hollywood royalty crop, from movie stars to founding fathers. Established in 1899, the former Hollywood Memorial Park was in receivership, on the verge of permanent closure back in 1998, until the Cassity family acquired it through public auction and began breathing new life into the property. Today, it's a stunning memorial park, one of the nicest around. Unfortunately, all that rehabilitation that might be in jeopardy, according to growing reports of scandalous financial problems within the Forever Network, resulting in the removal of the Cassitys from H4E property say sources. Say it ain't so! Maybe the ghost of former H4E owner/crook Jules Roth is causing havoc from the great beyond. Jason Grey, 29, was visiting his mother's grave on New Year's Day when he was shot to death, becoming Los Angeles' first homicide of 2008. On Wednesday, Grey's stricken father and three other relatives watched as detectives examined the area around the freshly dug grave of Grey's mother, where the Elysian Valley man was standing when he was killed. "Back in the days, he was involved with a gang, but he had left," said Erik Escobar, 32, of South Los Angeles, Grey's cousin. "He was trying to fix his life. But I'm guessing - you know, this is a public place, and probably some other rival gang found him here." Escobar said his cousin, a father of two, was no longer in a gang and, in fact, wanted to become a parole officer. Grey's mother died of a heart attack a couple of weeks ago, and Grey was alone at her grave site when he was shot, Escobar said. The grave of Grey's mother - in Forest Lawn Memorial-Park, Glendale, in a section that actually is in the city of Los Angeles - has white roses and fresh patches of sod. The grave is at the base of a hill, and Grey never made it up that hill after being shot, said Detective Jose Carrillo of the Los Angeles Police Department. Grey was pronounced dead at the scene. 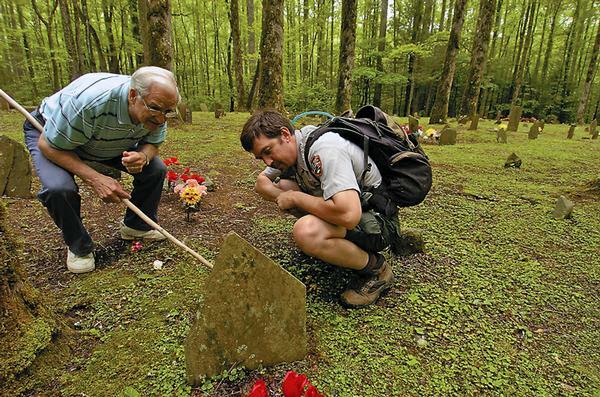 "It's almost unheard of, because a cemetery is sacred ground. It's supposed to be, anyway," said Sgt. Sanford Rosenberg, watch commander with the LAPD's Northeast Division, which is investigating the shooting. Investigators had few details on L.A.'s first homicide of 2008, but they said Grey was shot multiple times in the upper and lower body about 12:30 p.m. Tuesday. "We're looking for any information, anyone who might have been here that might have witnessed any part of it," Carrillo said. Carrillo said police know Grey and the shooter exchanged words before he was killed, but it was unclear what sparked the shooting. "We believe the motive could be a gang-related crime," Carrillo said, confirming that Grey was apparently once a gang member. William Martin, a spokesman for Forest Lawn, Glendale, said he cannot recall any other slaying at the cemetery. Forest Lawn, Glendale - a sprawling, green expanse of graves, statues and churches - is the final resting place of a number of movie stars, including Humphrey Bogart, Sammy Davis Jr. and Jean Harlow. Escobar said he attended Belmont High School with Grey, and the two ran track together but drifted apart as adults. Escobar said he knew his cousin had just started a new job, but he was unsure what it was. Silvia Head, 62 - herself the mother of a homicide victim - was at the cemetery about the time Grey was shot, but did not see the killing. Her son, Sonny, 26, was killed in 2001, and she comes to the cemetery three times a week to visit his grave. As Head stood near the scene of Tuesday's shooting, she expressed sympathy for Grey's family. "This happened to me six years ago, and this is so hard when you lose a son," she said. "The pain never (goes away)." Anyone with information about the shooting is asked to call detectives at 213-847-4261. Police continue to investigate incident in which man is shot several times at Forest Lawn cemetery. GLENDALE — Police said gang violence is likely the cause of the first reported homicide of the year in Los Angeles County, a shooting death at Forest Lawn cemetery on the Los Angeles-Glendale border. Los Angeles resident Jason Grey, 29, suffered multiple gunshot wounds to his upper body at about noon Tuesday while he was at the cemetery on South Glendale Avenue, Los Angeles Police Officer Ana Aguirre said. “It is being described as a gang-related motive, but that’s pretty much all we have,” she said. Police are unsure why Grey was at the cemetery, Los Angeles Police Officer Karen Smith said. Los Angeles County Coroner’s Office officials were slated to conduct an autopsy Wednesday, said Lt. Cheryl MacWillie, of the coroner’s office. Glendale police were the first to receive a call alerting them to the shooting on Tuesday, but responding officers turned the investigation over to the Los Angeles Police Department because the crime scene fell on the Los Angeles side of the park, Glendale Police Sgt. Tom Lorenz said. Cemetery officials would not comment, deferring all calls to the Los Angeles Police Department on Wednesday, Forest Lawn spokesman Bill Martin said. Residents describe the neighborhood adjacent to the cemetery as relatively safe, with a history of community activism on several blocks, including Colby Drive and Adams Street. Since the circumstances of the shooting are uncertain, some wonder if whether illegal activities are occurring on cemetery grounds. The crime occurred at an esteemed and popular memorial park, where many residents take guests from out of town for the tranquil atmosphere and scenic views, Lazer said. “The area has been pretty safe,” she said. But some nearby streets have had problems in the past, she said. About a year ago, neighbors near Adams banded together to put pressure on a landlord who owned a property where reported gang members were congregating, she said. The landlord cleaned up the property, banishing much of the criminal element from the area and residents have since held regular community meetings to discuss neighborhood issues and concerns, Lazer added. Click here to see the CBS2/KCAL9 News video report. GLENDALE, Calif. (CBS) - Homicide detectives were investigating the circumstances of a freshly-shot body found in the Forest Lawn Memorial Park in Glendale, a sergeant said on Tuesday. Police received calls around 1:32 p.m. about the body of a Hispanic male found in the cemetery at 1712 S. Glendale Ave., according to Los Angeles Police Department Sgt. Alcira Solis. It was unclear if he was murdered in the cemetery or if his body was dumped there after he was shot, she said. The exact cause of the victim's death was not immediately available. Los Angeles police and fire units were sent to the Glendale branch of Forest Lawn, where the entrance is on Glendale Avenue in Glendale, but most of the facility inside L.A. city limits. Paramedics sent to the scene were apparently delayed by confusion over the exact location of the apparent crime. Los Angeles' first homicide of 2008 has a macabre twist - a man found shot to death at a cemetery. The body of 29-year-old Jason Grey was discovered Tuesday at Forest Lawn-Glendale in the 1000 block of Glendale Avenue, police said. The Los Angeles and Glendale police departments received calls of shots fired about 12:40 p.m. in that general area. Grey was shot multiple times in the upper torso and died at the scene, LAPD Detective Percy Morris said. About 30 to 40 people were in the cemetery at the time of the shooting, but no one else was injured, Morris said. The LAPD is investigating because the body was found on the Los Angeles side of the cemetery. The death may be gang related. The burials of four accident victims from Laguna Woods -- 1 on Sunday, the others Monday, was corrected following mix-up. Rheta Kanter is resting next to her husband, Bruce, at Pacific View Memorial Park in Corona del Mar. She joined her late husband there Monday morning – one day after more than 200 relatives and friends watched what they thought was her body be lowered into a grave. Due to a mix-up that local funeral home officials blame on medical or mortuary officials in Tennessee, the body that was buried in Kanter's grave Sunday was that of her dear friend, Judith Stele. Kanter, 72, Stele, 66, Stele's husband, Brandt, 69, and Gloria Friedman, 65 – all of Laguna Woods – were killed in a violent car crash last week on a highway outside of Memphis. Now, compounding their grief, Kanter' relatives say they are extremely upset about the mix-up – which was corrected this morning. "This was incompetence,'' said Russ Reinoehl, the son-in-law of Rheta Kanter. He spoke for Kanter's daughter, Wendy, who was too distraught to comment. "No one should have to go dig up a body." Kanter, the Steles and Friedman died Wednesday during a cross-country road trip to visit Friedman's fifth grandchild, who – in a twist of fate – was born in Charlotte, N.C. less than three hours after the four seniors perished. PALMDALE - Barry Munz has both a personal and professional connection to the 121-year-old Palmdale Cemetery that the city is restoring after years of neglect. His great-grandparents, 19th century pioneer settlers John and Amalia Munz, are buried there, and Munz, a civil engineer, designed the plans for new fencing and other improvements. "I think it's a good thing they are doing because the cemetery was in a state of disrepair, and they are cleaning up and going to improve the entire area in remembrance of the city's origins," said Munz, 46. The cemetery, established by the city's first settlers, has languished for years, the target of vandals and thieves. It was littered with trash and debris despite efforts by volunteers to keep it clean. Grave markers went missing or were knocked over, and a vehicle smashed into the front block wall last summer. Late last year, the City Council passed a resolution to take over the cemetery and turn it into what state statutes refer to as a "pioneer memorial park." With such a designation, city government could restore and then maintain the memorial park. A $159,000 city contract was awarded in early December to begin the restoration with decorative wrought-iron fencing, gates and granite. I am working with Nick Smith who is organizing a memorial day service at Mountain View Cemetery 2400 N Fair Oaks Ave Altadena for May 28th at 3pm. Nick, Gayle Plunkett and I met with the cemetery management today and they were very enthused about the service and offered any help we needed!!!! Their comment "this is history and part of our community." I know that many of you are planning to attend the service at the National Cemetery in the morning, but this service is planned for the afternoon and should not conflict with your plans. This is the first time for this service and hopefully it will be build it into a regular event.